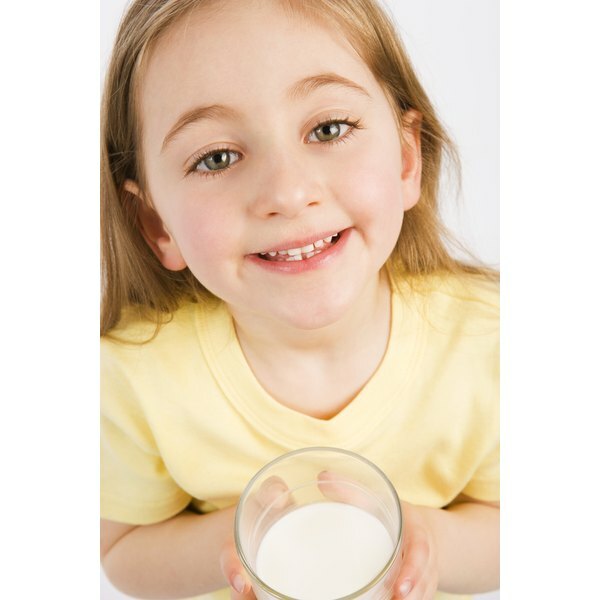 As children, most people become aware of the benefits of calcium and vitamin D in milk for building strong bones and teeth. Not many people realize that deficiency in these nutrients resulting from inadequate diet, illness or aging can cause disease, fatal hemorrhage, depression and schizophrenia. Calcium is also plays an essential role in proper heart function. Bones and teeth contain 99 percent of the body’s calcium stores, according to the Office of Dietary Supplements, National Institutes of Health. Insufficient dietary calcium increases the risk of bone thinning and the fractures, which occur with osteoporosis. Loss of bone mass also causes osteopenia, a less severe form of osteoporosis. Calcium’s role in securing your health is not only maintaining the strength, growth and repair of bones. Functioning as an electrolyte, calcium supplies the chemical energy that triggers contractions of the heart muscle and other muscles in your body. Calcium also facilitates the release of neurotransmitters, the chemicals that carry messages to the brain along the body’s network of nerves. A deficiency in calcium can prevent blood from clotting. Calcium converts the protein fibrinogen into fibrin, which is the basis of a blood clot. Insufficient calcium could cause a fatal hemorrhage, according to the Franklin Institute. Vitamin D helps regulate calcium levels, keeps bones strong and healthy, supports immune system functioning and may provide protection against diseases, such as multiple sclerosis, type I diabetes and colorectal and breast cancer. It may also have an impact on brain development and function, according to Children’s Hospital and Research Center. The problems associated with vitamin D deficiency include interference with calcium absorption, which leads to bone-softening diseases such as rickets in children and osteomalacia in adults. Deficiency in children can result in fractures and deformities. Low blood levels of calcium, resulting insufficient vitamin D, trigger the chemical process that causes the leaching of calcium from bones. This enables the body to maintain the metabolic functions that require calcium. According to the Office of Dietary Supplements, vitamin D deficiency often occurs in people who are lactose intolerant because they may avoid milk and other dairy products. Lactose intolerance occurs in people who lack the lactase enzyme needed to digest lactose, a sugar found in milk. People who have a milk allergy also may have a problem with vitamin D deficiency. In addition to dietary sources of vitamin D, humans have the unique ability to produce this vitamin from sunlight exposure. Speak with your doctor before taking vitamin D supplements to eliminate the risk of adverse side effects from excessive intake. A review published in April 2008 in the journal, “Federation of American Societies for Experimental Biology,” indicates that while there is evidence linking adequate vitamin D intake with brain development and function, a causal relationship between vitamin D deficiency and cognition is not strongly supported. Reviewed research to connect depression and schizophrenia to insufficient vitamin D intake, however, did not present conclusive evidence, due to limited studies. The daily recommended intake for calcium is 1,300 milligrams for teenagers, 1,000 milligrams for adults ages 19 to 50 and 1,200 milligrams for adults 51 years of age or older. The recommended for vitamin D is 600 International Units for children and 800 International Units for adults, according to the Dietary Guidelines for Americans, 2010. Federation of American Societies for Experimental Biology: Is There Convincing or Behavioral Evidence Linking Vitamin D Deficiency to Brain Dysfunction?